Interested in carrying our pet hemp products? Healthy Hemp Pet Company, established 2014, is a leader in all-natural hemp products for pets and marketplace transparency. We proudly use certified organic full-spectrum PCR-hemp oil grown in Colorado, using the latest in vapor distillation to maintain chemical-free hemp oil. We use only the highest quality ingredients! We offer a range of hemp infused pet products that offer pet owners and clinicians a safe method to treat animals holistically and forgo harsh pharmaceutics. We’ve helped numerous dogs, cats, horses and other animals with pain, arthritis, anxiety, seizures, and other health related issues. You can view our wholesale pricing here – keep in mind, we have no minimum order requirements! You can read recommendations from some of our current retailers here. 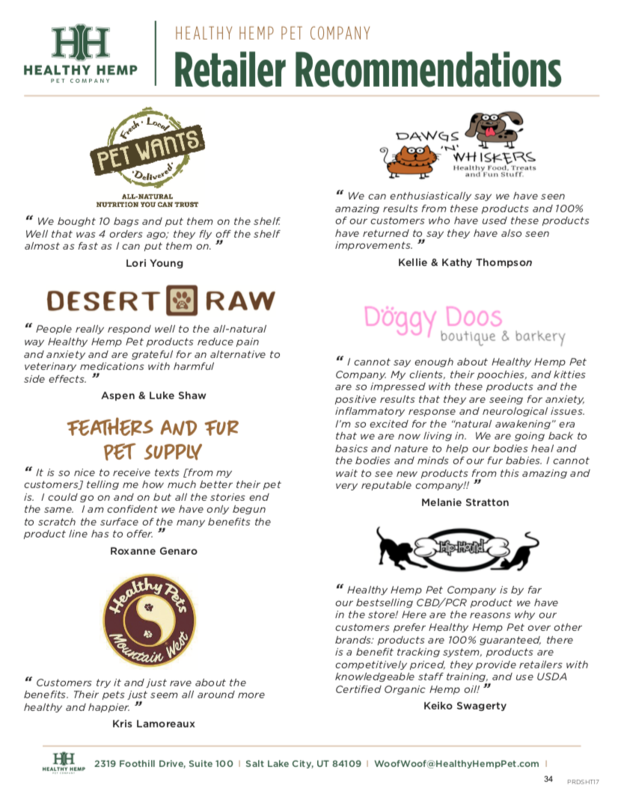 Check out our Healthy Hemp Pet Company fact sheet here. For more information, fill out the following form and we’ll be in touch!